Today in Masonic History Norman Vincent Peale is born in 1898. 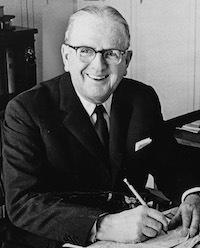 Norman Vincent Peale was an American minister and writer. Peale was born in Bowersville, Ohio on May 31st, 1898. He graduated from Bellefontaine High School, Bellefontaine, Ohio. He earned degrees at Ohio Wesleyan University and Boston University School of Theology. He was ordained a Methodist minister in 1922. In 1932 he changed his religious affiliation to the Reformed Church in America. For 52 years he was a pastor at the Marble Collegiate Church in Manhattan. During the Great Depression, Peale along with James Cash Penney, founder of J.C. Penney; Arthur Godfrey, television and radio personality; and Thomas J. Watson, President and Founder of IBM; created 40plus an organization that helps unemployed managers and executives. In 1940, Peale wrote his first book with Smiley Blanton. The book titled Faith Is the Answer: A Psychiatrist and a Pastor Discuss Your Problems, was written in a style that each man took a chapter, alternating throughout the book. In 1951, the two men opened American Foundation of Religion and Psychiatry next to the Marble Collegiate Church. Blanton handled the serious psychological cases and Peale who had no mental health credentials handled religious issues. The following year in 1952, Peale on his own wrote The Power of Positive Thinking. The two men, Peale and Blanton, had something of a falling out over the book. The book was heavily criticized by the mental health community. Most claimed that the science that Peale was using in the book was anecdotal at best. Blanton refused to endorse the book. A later book by Blanton contrasted greatly with The Power of Positive Thinking. In 1960, Peale as the spokesman for 150 protestant clergymen, who opposed the election of John F. Kennedy. Peale's argument was that a Roman Catholic would have to serve the needs of the church in Rome before the will of the American people. He also predicted that Kennedy's presidency would mean the end of freedom of speech. Peale's stance was widely criticized by other religious leaders including other protestants. He was also criticized by President Harry S. Truman. After the fallout from his statements Peale refrained from any future partisan rhetoric. Peale passed away on December 24th, 1993. On the event of his passing, President Bill Clinton would say "The name of Dr. Norman Vincent Peale will forever be associated with the wondrously American values of optimism and service. Dr. Peale was an optimist who believed that, whatever the antagonisms and complexities of modern life brought us, anyone could prevail by approaching life with a simple sense of faith. And he served us by instilling that optimism in every Christian and every other person who came in contact with his writings or his hopeful soul. In a productive and giving life that spanned the 20th century, Dr. Peale lifted the spirits of millions and millions of people who were nourished and sustained by his example, his teaching, and his giving. While the Clinton family and all Americans mourn his loss, there is some poetry in his passing on a day when the world celebrates the birth of Christ, an idea that was central to Dr. Peale's message and Dr. Peale's work. He will be missed." Peale was a member of Midwood Lodge No. 1062 in Brooklyn, New York. He was also a 33° Scottish Rite Mason.